Regional definitions vary from source to source. New Mexico and Arizona (in dark red) are almost always considered the core, modern-day Southwest. The striped states may or may not be considered part of the same region. 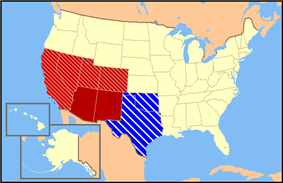 With the exception of Texas and Oklahoma (offset in blue), the southwestern states are also classified as West by the US Census Bureau. The Southwestern United States (also known as the American Southwest or simply the Southwest) is a region of the United States defined in different ways by different sources. Broad definitions include nearly a quarter of the United States, including Arizona, California, Colorado, Nevada, New Mexico, Oklahoma, Texas, and Utah. Narrowly defined, the "core" Southwest is centered on the Four Corner states, with parts of the other states making up the beginnings and endings of the Southwest. The five main southwestern states, Arizona, New Mexico, Colorado, Utah, and Nevada, are also all considered part of the Mountain West as well as the Southwest. The total population of these states is roughly 19 million people. 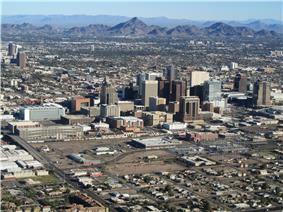 The top 5 biggest cities in the Southwest (in order) are: Phoenix, El Paso, Denver, Las Vegas, and Albuquerque. Most of it was a part of the Viceroyalty of New Spain, in the Spanish Empire, during the Modern Era. What is now California, Arizona, Nevada, Utah, New Mexico, and portions of Colorado, Wyoming, Oklahoma and Kansas were part of Mexico before the Mexican-American War and the Gadsden Purchase of 1853. Portions of some of the areas in the "divided" states, and including western parts of Texas, beginning in San Antonio, were those in dispute after the Texas Revolution. Geographer Uriah D. W. Meinig defines the core of the Southwest as the portion of New Mexico west of the Llano Estacado and the portion of Arizona east of the Mohave-Sonoran Desert and south of the "canyonlands" and also including the El Paso district of western Texas and the southernmost part of Colorado. He identifies four distinct subregions with this core. He calls the first subregion "Northern New Mexico", and describes it as focused on Albuquerque and Santa Fe. It extends from the San Luis Valley of southern Colorado to south of Socorro and including the Manzano Mountains, with an east-west breadth in the north stretching from the upper Canadian River to the upper San Juan River. 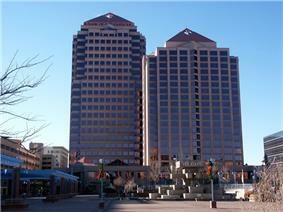 The area around Albuquerque is sometimes called Central New Mexico. Meinig calls the third subregion "El Paso, Tucson, and the Southern Borderlands". While El Paso and Tucson are distinctly different cities they share a similar and somewhat overlapping hinterland between them. Tucson occupies a large oasis at the western end of the El Paso-Tucson corridor. The region between the two cities is a major transportation trunk with settlements servicing both highway and railway needs. There are also large mining operations, ranches, and agricultural oases. Both El Paso and Tucson have large military installations nearby; Fort Bliss and White Sands Missile Range north of El Paso in New Mexico, and, near Tucson, the Davis-Monthan Air Force Base. Albuquerque has Sandia National Laboratories and Kirtland Air Force Base. About 70 miles (110 km) to the southeast are the research facilities at Fort Huachuca. These military installations form a kind of hinterland around the El Paso-Tucson region, and are served by scientific and residential communities such as Sierra Vista, Las Cruces, and Alamogordo. El Paso's influence extends north into the Mesilla Valley, and southeast along the Rio Grande into the Trans-Pecos region of Texas. The fourth subregion Meinig calls the "Northern Corridor and Navaholands". A major highway and railway trunk connects Albuquerque and Flagstaff. Just north of the transportation trunk are large blocks of American Indian land. Phoenix, Tucson, and Las Vegas dominate the westernmost metropolitan areas in the southwestern region, while Albuquerque, Denver, Colorado Springs, and El Paso dominate the easternmost metropolitan areas of the Southwest, not including Northern, Central, and Eastern Texas or Oklahoma because they are not always considered part of the Southwest. 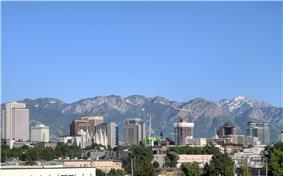 Reno and Salt Lake City also dominate the northernmost metropolitan areas of the Southwest. Thus the basic spatial structure of the Southwest can be seen as focused on the largest metropolitan areas in each state such as Phoenix, Albuquerque, Denver, Salt Lake City, Las Vegas, and El Paso. Also, the Four Corners of Colorado, Utah, Arizona, and New Mexico is often considered the center, or heart, of the American Southwest. Prior to the arrival of Europeans, the southwestern United States was inhabited by a very large population of American Indian tribes. Some of the larger and more popular tribes of American Indians in the Southwest were the Ute, Navajo, Apache, Comanche, Paiute, Hopi, and Anasazi. The Ute formally ruled over most of modern day Utah and Colorado, as well as small parts of northern New Mexico. The Navajo had ruled over much of Arizona, New Mexico, and parts of Utah at one point as well. Apache tribes had once ruled over many lands in the Southwest such as most of New Mexico, eastern Arizona, and parts of southwestern Texas. The Jicarilla tribe of Apache also ruled well into southern and southeastern Colorado as well. The Comanche ruled many lands in the Southwest as well. Their historic range consisted of present day eastern New Mexico, southern and southeastern Colorado, northeastern Arizona, and most all of west and northwest Texas. The Paiute people were another very large American Indian civilization. They controlled most all of present day Nevada, western Utah, and northern Arizona. 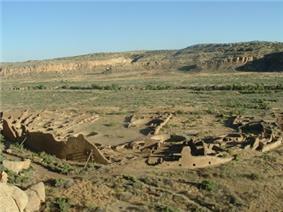 Some of the oldest evidence of American Indians in the Southwest are the Hopi and the Anasazi people. The Hopi controlled most all of what is modern day Arizona at one point. On the other hand, the Anasazi (Ancient Pueblo peoples) controlled much of the Southwest as well. Their ancient territory consisted of northeastern Arizona, northwestern New Mexico, southeastern Utah, and all of southern Colorado. Some of the more known evidence of the ancient pueblo peoples can be found at Chaco National Park in New Mexico, and Mesa Verde National Park in Colorado. Vegetation of the Southwest generally includes various types of yucca, along with saguaro cactus, barrel cactus, prickly pear cactus, desert spoon, creosote bush, sagebrush, and greasewood. Although, cacti is thought to only grow in Arizona and New Mexico, many native cacti grow throughout Nevada, Utah, Colorado, and West Texas. Also, small cacti grow in Utah and Colorado. These examples (except the saguaro), can be seen growing natively and in large numbers more east throughout the Texas Hill Country and South Texas and the Rio Grande Valley. However, none of the vegetation discussed grows natively the further east than the eastern outskirts of Fort Worth. Dallas and Houston, for example, share a similar terrain with states further east and are often considered more of the American South. In the far eastern parts of the Southwest, prairies and grasslands are found all over. These prairies and grasslands are usually located in Eastern Colorado, Eastern New Mexico, and large areas in West Texas. Steppe is also located all over the high plains areas in Colorado, New Mexico, and Texas. The mountains of the southwestern states have large alpine trees. 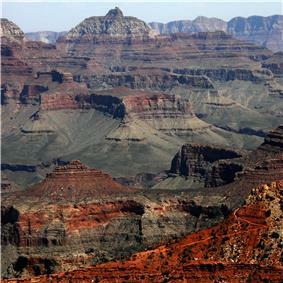 Landscape features of the core southwestern areas usually include mountains, mesas, high broad basins, plateaus, desert lands, and some plains. The High Plains region of the Great Plains is also located in the American Southwest. 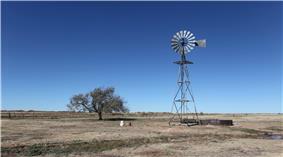 Eastern Colorado, Eastern New Mexico, and West Texas all have high plains, and rolling land. 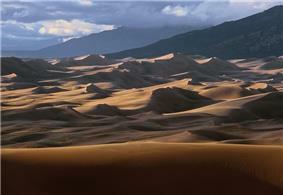 The entire southwestern region features semi-arid to arid terrain. The far eastern part of southwestern Texas, for example the Texas Hill Country, consists of dry, tall, and rugged rocky hills of limestone and granite. South Texas and the Rio Grande Valley is mostly flat with many places consisting of scrub and bare topsoil, much like the deserts further west. Buttes are also located all over the southwestern states. Utah tends to have the most natural buttes, but they do form as far east as some parts of Central Texas. There is a wide variety of wildlife in the southwestern United States. Bighorn sheep, bobcat, coyote, bear, jackrabbit, cottontail rabbit, mule deer, white-tailed deer, gray fox, mountain lion, river otter, porcupine, pronghorn, raccoon, armadillo, Mexican wolf, and gray wolf can be found in all states across the Southwest. American bison and prairie dogs can be found in the southwestern states of Colorado, New Mexico, and Texas. Elk in the Southwest are usually only found in Colorado, New Mexico, Utah, and Arizona. White-nosed coati and collared peccary in the Southwest are normally found in Arizona, New Mexico, and Texas. Snakes are also found all over the southwestern United States. Rattlesnakes are found in the Southwest. Coral snakes can be found in Arizona, New Mexico & Texas. The southwestern United States features a semi-arid to arid climate, depending on the location. Much of the Southwest is an arid desert climate, but higher elevations in the mountains in each state, with the exception of West Texas, feature alpine climates with very large amounts of snow. The metropolitan areas of Phoenix, Tucson, Las Vegas, and El Paso hardly ever receive any snow at all, as they are strictly desert lands with mountains. However, the metro areas of Reno, Salt Lake City, Denver, and Colorado Springs can receive significant snowfalls. Albuquerque falls in between, receiving less snow than other cities, but still receive significant snowfalls in the winter time. Although it snows in this region, the snow in this part of the United States melts rapidly, often before nightfall. This is due mainly to the higher altitude and abundant sunshine in these states. Nevada and Arizona are both generally arid with desert lands and mountains, and receive large amounts of snow in the higher elevations in and near the mountains. New Mexico, Utah, and Colorado are generally arid, with desert lands and mountains as well. Colorado and New Mexico do have high plains in the far eastern portions of their state. They all receive decent amounts of snow and large amounts of snow in the high elevations in the mountains, although some areas in far southwestern and southern New Mexico do not receive much snow at all. West Texas is generally arid as well but does not receive the same amount of snow that the other southwestern states receive at their high elevations. The terrain of western Texas in the Southwest is the flat, rolling land of the plains, which eventually turns into a desert with some hills, and there are significant mountains as well once you reach the Trans-Pecos area. 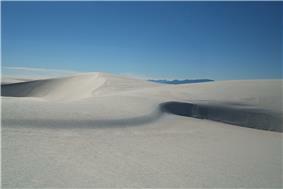 The term "High Desert" is also synonymous with this region. The High Desert is generally defined as the Mojave Desert, which extends from inland southern California into southern Nevada and southwestern Utah. The Great Basin Desert is defined as the desert lands in Nevada, Western Utah, as well as Southeastern Oregon and Southern Idaho. The High Desert also extends into other parts of the Northwest, such as the Red Desert in southwestern Wyoming. The High Desert is very different from the general desert lands found in Arizona, in the Sonoran Desert. This area of the desert land generally sits at a very high elevation, much higher than the normal desert land, and can receive very cold temperatures at night in the winter (with the exception of California, southern Nevada and southwestern Utah), sometimes near zero degrees on very cold nights. The High Desert also receives a decent amount of snowfall in the winter (with the exception of California, southern Nevada and southwestern Utah) but melts very quickly. Other areas of the Southwest may also be referred to as the "High Desert" such as the Cortez, Dove Creek, Canyon of the Ancients National Monument, Four Corners Monument, Montrose, Blue Mesa Reservoir, Pueblo, San Luis Valley, and the Great Sand Dunes. Besides the Chihuahuan Desert, lands in southwestern and southern New Mexico, they also have scattered desert lands in the northwestern and northern portions of their state, which is referred to as the high desert. 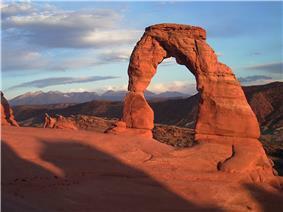 The southwestern United States contains many national monuments and parks. Some of the more famous monuments and parks in the Southwest are the Grand Canyon National Park, Navajo National Monument, Four Corners Monument, Colorado National Monument, Great Sand Dunes National Park, Arches National Park, Red Rock Canyon, Big Bend National Park, and the White Sands National Monument. In Utah there are also many other monuments and parks such as, Nine Mile Canyon, Mexican Hat, Bryce Canyon National Park, Canyonlands National Park, Capitol Reef National Park, Zion National Park, Arches National Park, Natural Bridges National Monument, Cedar Breaks National Monument, Hovenweep National Monument (also in Colorado), Monument Valley (also in Arizona), Grand Staircase-Escalante National Monument, Rainbow Bridge National Monument, and the Timpanogos Cave National Monument. In Arizona there is the Petrified Forest National Park, Pipe Spring National Monument, Saguaro National Park, Sonoran Desert National Monument, Sunset Crater Volcano National Monument, Tonto National Monument, Tumacacori National Historical Park, Tuzigoot National Monument, Vermilion Cliffs National Monument, Walnut Canyon National Monument, and the Wupatki National Monument. In Colorado there is the Grand Mesa, Garden of the Gods, Blue Mesa Reservoir, Glenwood Canyon, Canyon of the Ancients National Monument, Yucca House National Monument, and Bent's Old Fort National Historic Site. In New Mexico there is also the Aztec Ruins National Monument, Bandelier National Monument, Capulin Volcano National Monument, Carlsbad Caverns National Park, Chaco Culture National Historical Park, El Malpais National Monument, El Morro National Monument, Gila Cliff Dwellings National Monument, Kasha-Katuwe Tent Rocks National Monument, Pecos National Historical Park, Petroglyph National Monument, and the Salinas Pueblo Missions National Monument. In the western Texas part of the Southwest, there is the Alibates Flint Quarries National Monument, Big Bend National Park, Chamizal National Memorial, Fort Davis National Historic Site, Guadalupe Mountains National Park, Lake Meredith National Recreation Area, and the Amistad National Recreation Area. In Nevada there is the Great Basin National Park, Death Valley National Park, and the Lake Mead National Recreation Area. Hispanic Americans (mostly Mexican Americans, with large populations of Spanish Americans) can be found in large numbers in every major city in the Southwest such as El Paso (80%), San Antonio (61%), Albuquerque (47%), Phoenix (43%), Tucson (41%), Austin (35%), Denver (32%), Las Vegas (32%), Reno (22%), Salt Lake City (22%), Colorado Springs (16%), and Provo (15.2%). Houston (44%), Dallas (43%), and Fort Worth (34%) have large Latino populations as well but are not always considered part of the Southwest and are often grouped more with the South. Very large Hispanic American populations can also be found in the smaller cities such as, Las Cruces (56%), Santa Fe (48%), Farmington (22%), Roswell (51%), Alamogordo (32%), Pueblo (48%), Greeley (35%), Longmont (25%), Brighton (41%), Carson City (20%), Amarillo (27%), Lubbock (31%), Midland (37%) and Odessa (47%). Many small towns throughout the southwestern states also have significantly large Latino populations. The largest African American populations in the Southwest can be found in Denver (10%), Las Vegas (10%), Colorado Springs (7%), and Phoenix (5%). The Dallas/Fort Worth and Houston areas both have very large African American populations, although those parts of Texas are not usually considered part of the southwestern United States. The largest Asian American populations in the southwest can be found in Nevada and Utah, with some other significant Asian populations in Denver and Phoenix. 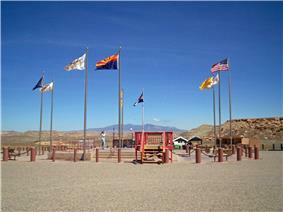 The most significant American Indian populations can be found in New Mexico and Arizona. The area also contains many of the nation's largest cities and metropolitan areas, despite relatively low population density in rural areas. Phoenix is among the top ten most populous cities in the country, and Reno, Albuquerque, Colorado Springs, and Salt Lake City are some of the fastest-growing cities in America. Also, the region as a whole has witnessed some of the highest population growth in the United States, and according to the US Census Bureau, in 2008–2009, Utah was the fastest growing state in America. As of the 2010 Census, Nevada was the fastest growing state in the United States, with an increase of 35.1% in the last ten years. Additionally, Arizona (24.6%), Utah (23.8%), Texas (20.6%), and Colorado (16.9%) were all in the top ten fastest growing states as well. Among the major sports leagues, the National Basketball Association has had a Southwest Division since 2004. It includes teams from Texas, Tennessee and Louisiana. In addition, there are NBA teams in Denver (Denver Nuggets), Phoenix (Phoenix Suns), and Salt Lake City (Utah Jazz), as well as four teams in California, sometimes considered part of the Southwest. The WNBA has one team in the Southwest area, the Phoenix Mercury. The National Collegiate Athletic Association has had two Division I conferences named Southwest. The Southwest Conference was active from 1914 to 1996 and featured teams from Texas, Arkansas, and Oklahoma. The Southwestern Athletic Conference, established in 1920, has comprised teams from Texas, Oklahoma, Louisiana, Arkansas, Mississippi, and Alabama. Major League Baseball has teams in Arizona and Colorado, as well as five teams in California and two teams in Texas. ^ denver co – Google Maps. Maps.google.com (1970-01-01). Retrieved on 2011-01-27. ^ Southern Focus Poll 1992-1999. Odom Institute; Center for the Study of the American South. ^ Phoenix city, Arizona – Population Finder – American FactFinder. Factfinder.census.gov. Retrieved on 2011-01-27. 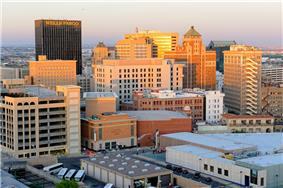 ^ Reno city, Nevada – Population Finder – American FactFinder. Factfinder.census.gov. Retrieved on 2011-01-27. ^ Denver city, Colorado – Population Finder – American FactFinder. Factfinder.census.gov. Retrieved on 2011-01-27. 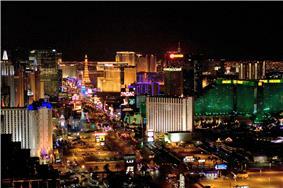 ^ Las Vegas city, Nevada – Population Finder – American FactFinder. Factfinder.census.gov. Retrieved on 2011-01-27. ^ Albuquerque city, New Mexico – Population Finder – American FactFinder. Factfinder.census.gov. Retrieved on 2011-01-27. ^ Tucson city, Arizona – Population Finder – American FactFinder. Factfinder.census.gov. Retrieved on 2011-01-27. ^ Mesa, Arizona – Population Finder – American FactFinder. Factfinder.census.gov. Retrieved on 2011-01-27. ^ Colorado Springs city, Colorado – Population Finder – American FactFinder. Factfinder.census.gov. Retrieved on 2011-01-27. ^ Aurora, Colorado – Population Finder – American FactFinder. Factfinder.census.gov. Retrieved on 2011-01-27. ^ Henderson, Nevada – Population Finder – American FactFinder. Factfinder.census.gov. Retrieved on 2011-01-27. Bozanic, Andrew D. A., “Preserving Pictures of the Past: The Packaging and Selling of the American Southwest with an Emphasis on the Historic Preservation,” Nevada Historical Society Quarterly, 53 (Fall–Winter 2010), 196–214.